I hope you are all well. Today I am back to share a Christmas card with you. I am quite a slow cardmaker and therefore I have to start my Christmas cards early, particularly as most of them take me between 1-2 hours! So here is today’s card. I began by blending Distress Inks and Distress Oxides over an A2 panel of white cardstock. 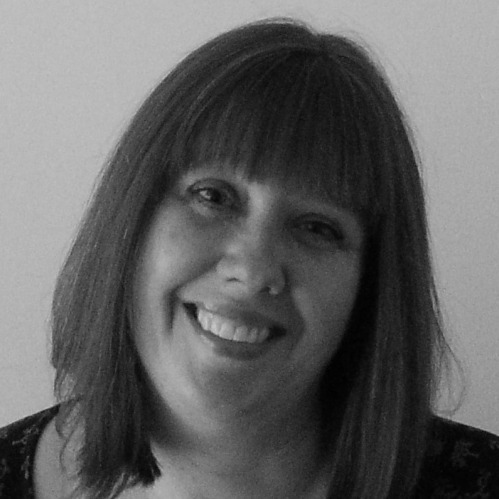 I went for a bit of a funky background colour – I love lots of colour on a card. I then took some texture paste and mixed in a little bit of white gouache in an attempt to make it stay whiter (it has a tendency to sometimes look a bit creamy or sometimes picks up the colour behind it). By and large I think this worked better but it’s still not as white as I would like. Maybe I just need a different paste. I applied the paste through the SSS Falling Snow stencil and set it aside to try. Next I took my MFT Snow Drifts dies and die cut three snow banks. The penguins were actually coloured with Copics about two years ago (!) and had not been used, so I die cut those and then it was time to assemble the card. The background panel was die cut with a Hero Arts Infinity Rectangle – you could trim it with a trimmer, but the die gives a really nice finish to the panel. It was adhered to my base card with DST. I then took the snow banks and adhered the first with DST and the other two layers with foam tape so that there is some dimension and I can slot my penguins in amongst them. The penguins were then either adhered with foam tape or wet adhesive depending on their final resting place :). The greeting was double stamped onto white cardstock using Memento Tuxedo Black and trimmed to size. This was then adhered with foam tape. I added some shimmer to their bellies and that finished the card. 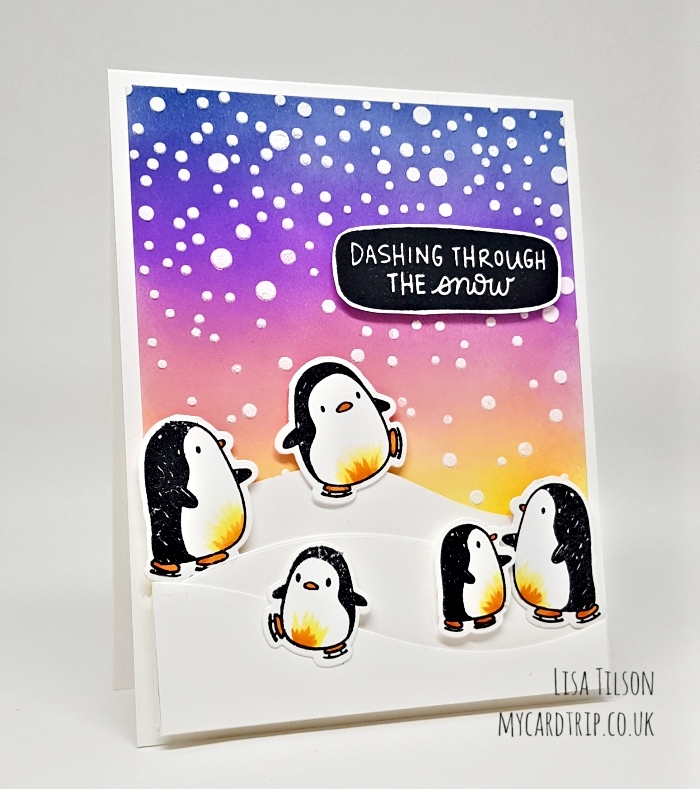 Penguins are a great option for Christmas cards as they don’t require much colouring, so expect to see more of them! I hope you are getting some crafting time in and I wish you all a fabulous week and weekend ahead. i think it’s worth the couple of hours then. adorbs. so question: if you had to pick a watercolor for beginners, which one would it be?? 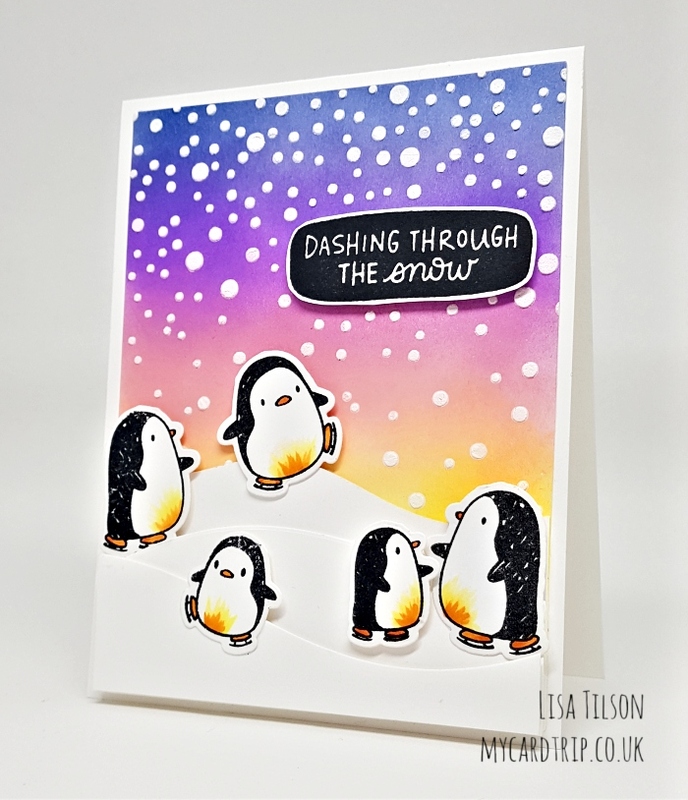 Your blending is fab, those tux wearing penguins are adorable. I struggle with blending everytime. It’s allergic to me I swear. Thanks for sharing a fab card. I don’t think you’re slow. It takes me a good while to make a good card, also. Once you know your layout and colors it makes it quicker to do a few at a time. Not lickety split quick but at least quicker. One of my children and their spouse sat down and watched me make one card. I did a lot of Copic coloring on it. They were amazed at how many colors I used and how long it took to make one card. They have always loved my cards but since then they’ve really had a lot of love because they know how long it takes to make. Your penguin card is beautiful. The background is lovely and of courses the sentiment is perfect. Love your. Card. The penguins are so cute. Ohhh ! This little scene is so adorable! Love your beautiful snowy sky. 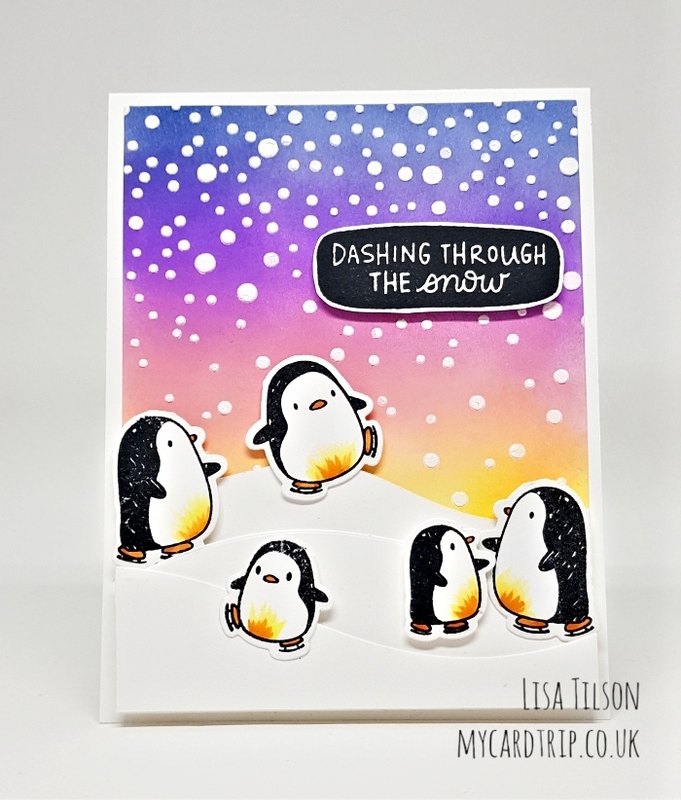 The colours are fabulous and the little penguins are so cute . Another beautiful card from you, Lisa. Thanks so much for sharing and inspiring !